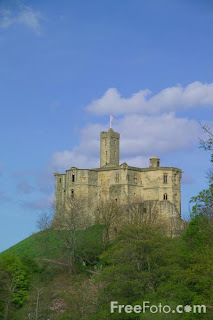 Warkworth is dominated by it's magnificent castle that stands proudly at the top of the Village, visible for miles around. The Castle is now owned by English Heritage and is a popular location for many events and outdoor theatre throughout the year. It is rich with history, it was once the home to the Percy Family, who now live in Alnwick Castle. Visiting the Castle is a must, they offer a free audio tour to explore it's fascinating history, two scenes from William Shakespear's Henry IV Part 2 were set in the Castle. Don't miss the Medieval Hermitage (a chapel carved into the stone) hidden away on the South bank of the river Coquet, it is only accessible by boat! At the other end of the Village, right by the banks of the River Coquet is the parish church of St Lawrence. This a beautiful and peaceful location with the River flowing gently around the Churchyard. A church has stood on this site for almost thirteen centuries, and you can certainly feel the incredible history in it's walls. There are records from 727AD of the King of Northumbria giving the church of St Lawrence to the Monks of Holy Island. The current church that stands at the site was built in 1132, it wasn't built just as a place of worship, it was also a defence against attack. The windows are mere slits and set very high up the wall. The is an excellent guide to church's rich history available on their website. The beach is a good walk from the Village centre, probably about 10 to 15 minutes and the route is marked by a blue line on our Village map. You can however drive out of the village and park closer to the beach near Warkworth Golf Club where there are also picnic tables. The Good Beach Guide recommends the beach here saying the water is of the highest UK quality for bathing and it's a lovely walk from here to Alnmouth. This stretch of beach is quiet and you certainly won't see it full of tourists. You're more likely to see locals walking their dogs (their are no restrictions on dogs on any of the beaches in the area) and enjoying the scenery. Northside Surf School offer beach surf lessons on several beaches along the Northumberland Coast including Warkworth Bay. Courses start at 2 hours and go up to 5 days and are run by Jon Nolan, a British Surfing Association Coach and an RLSS Beach Lifeguard so you know you're in safe hands. They operate 7 days a week and 12 months of the year and cater for all needs. The beach at Warkworth is perfect for a long, undisturbed walk. At low tide it is simply a vast expanse of golden sand, with views of the Coquet Island out to sea and Alnmouth to the North. Warkworth sits almost surrounded by a natural bend in the River Coquet and this makes walks along the river in any direction from Warkworth a beautiful experience. There are usually a large number of ducks and swans to feed on the riverbank and also picnic tables facilities near the church and car parks. Northumberland is well served with a huge variety of Golf Courses and Warkworth Golf Course is located just outside of the Village to the North-East and offers nine holes of links course. The course was created in 1891 and offers stunning views of the coastline to the North towards Alnmouth and back in land to Warkworth Castle. Other courses nearby include Alnmouth Golf Club and Alnmouth Village Golf Club, for a full list of Gold Courses in Northumberland visit our Golf Page. Warkworth's main road has many interesting galleries and shops to visit. From souvenirs and antiques to high end art and fashion, the Village offers an excellent choice. The Greenhouse on the corner of Dial Place and Castle Street isn't a plant shop as you might expect from the name, it's like an alladin's cave of antique furniture, arts and crafts. Present Time, also in Dial Place is a gift shop that offers china, designer cards, glassware, silverware and much more. The Fenwick Gallery represent some of the UK's finest artists and designers. They offer an excellent collection of paintings, prints, ceramics, glass, sculpture, jewellery and textiles, it's not however the place to go if you're after a thrifty souvenir of the area. Gray's of Warkworth, an award-winning fashion store, are a little further up Bridge Street towards the Castle on the right hand side of the road. They sell all kinds of ladies clothes, scarves, jewellery, bags and accessories and generally at a very reasonable price. Also worthy of mention is Bridge Street Gifts, which is on Bridge Street, of course!